Amateurs might fantasize about opening their own importing company, one where they enjoy a life of tasting amazing wines (for free! ), traveling to all the best vineyards and bringing exciting new products to the market that eagerly awaits the next big thing in the wine world. Sadly, I get the sense that the day-to-day of wine importing is far from the fantasy. Not knowing any industry insiders, this is all speculation but have a look at the “List of Wine Personalities.” Zero wine importers listed for the US, and only one wine importer listed anywhere (Englishman Pat Simon, RIP). Fame and fortune? Maybe fortune, not fame. And yet, wine importers deserve respect and sometimes even receive it. Last year, the wine importer Joe Dressner (of Louis/Dressner) passed away and the outpouring of grief came from some of my favorite names in the wine industry: see here and here (and how he rocked my world with Vouvray). He was apparently a pretty atypical guy who cared enormously about the quality of his wines and cared a great deal about putting his name on wines, which is really what every importer should be striving for. Typically though, importers have their name in tiny font on the back label, underneath anything else that people will actually read. Surgeon general warning, alcohol content, long and boring description of the wine – oh, there’s the importer, right after all that. 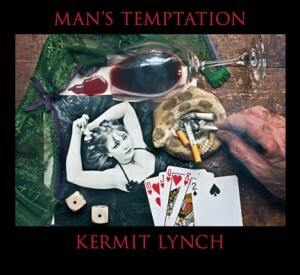 But then there’s Kermit Lynch. He’s an importer who’s not afraid to throw his name front and center on the FRONT of the bottle and announce with stentorian charm that “This bottle is approved by Kermit Lynch.” Kermit Lynch is a name worth paying attention to, not just because bloggers loved Kermit, but because he shows surprising, sometimes shocking wines. Beaujolais is the wine of the day, and I’m convinced it will take years before I’ve mastered the art of spelling it correctly. 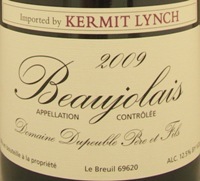 Beaujolais is also a wine that Kermit approves, at least the kind of Beaujolais wine made by Domaine Dupeuble Pere et Files (Dupeuble Wine Estate, Father and Sons). Light body, almost no tannins to annoy, round cherry taste, fun and fruity without being too sweet, slightly spicy on the end. * Gamay’s full name is “Gamay Noir a Jus Blanc,” which means “Black Gamay with White Juice.” Surprising to no one, the grape is black and the juice it produces is white. * Sparkling Gamay exists and is just as polarizing as the regular Gamay (h/t Beaujolais Nouveau hatred). * Dukes are allowed to just flat-out ban grapes for being “a very bad and disloyal plant.” Imagine what they would do to disloyal duchesses.